Risk Engine Architecture | EuroRisk Systems Ltd.
To ensure easy consumption by cross platform clients, user access to the server is performed solely via the APIs, which are kept in compliance with the industry standards. Intra Net Server – RE server runs in an application server within the LAN and is accessible by all types of API compatible clients. Out of the box RE provides desktop and mobile browser based client. 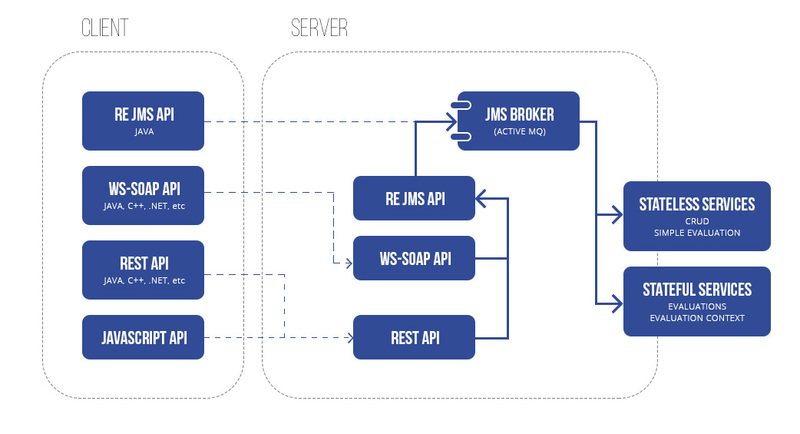 Internet WEB Server – RE exposes its WS-SOAP and REST API over HTTP and all API compliant applications can use it. Out of the box RE provides desktop and mobile browser rich client. Service Server – RE runs behind another front-end application that communicates with the respective API. The front-end application performs on all platforms, e.g. on Java, C# .Net, C++, Scripts etc. Stand-alone client and server within a single box. RE supports all financial objects, e.g. instruments, positions, transactions, portfolios, scenarios, etc. Service server with horizontal and/or vertical scaling that operates in the background of existing systems, e.g. core banking systems, accounting systems, management systems, data provider, data ware houses etc. Market data import - RE highly depends on the quality of market data. The required data is usually kept in data warehouses or is available through other heterogeneous sources, that grant integrity and quality. To that end, RE relies on data import, aggregation and cleansing which is accopmlished via its API and/or standard importer. Data processing through analytical modules - a set of analysis, data subsets, etc. is defined through the required evaluation via the API system. The processing is concurrent with high specialisation and optimisation in the financial domain. Result reporting – results are provided via the API, stored into result tables in the data base or reported through the supported reporting engines: Crystal reports, Jasper reports, Oracle reports, OLAP reports, based on QlikView, MS Excel.